The best roadside assistance Tempe Arizona has to offer! So you in need of roadside assistance in Tempe Arizona? Not a problem. Roadside assistance is essentially having a dedicated pit crew available at your disposal 24 hours a day, whenever you need emergency towing assistance on the road. With Tow Tempe in charge, we are your dedicated pit crew for all your roadside service towing needs. You tell us the problem and we will deliver what you need. 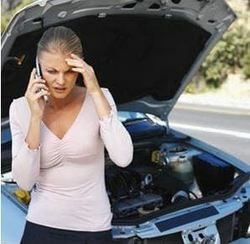 With the roads being so packed with traffic, you never know when you may need that emergency roadside assistance. We are always on call to help with your towing needs. We offer a full service assistance package for towing your vehicles and assisting you when you need it most. Don't risk your tow with a shady towing company for anything that you may need assistance with. We are committed to helping you with all our roadside vehicle problems here in Tempe and the entire eastern Arizona Valley. So what exactly are the benefits to having roadside assistance? Well first and foremost you have someone at your disposal to help you on the road whenever you need help. How cool is that? It's really just peace of mind in taking care of all your vehicle problems that my arise while your driving on the Arizona highways or roads. Also the benefit of roadside assistance is its affordable to everyone, even the average Joe. Our rates are extremely affordable and we love helping our customers whenever they need towing assistance in Tempe. So let us know what you need help wit hand we will take care of it. We excel at benefiting the customer with towing assistance. So when your shopping around for reliable Roadside assistance, how do you know which tow truck company you should choose? Well that's a very simple question. The answer is experience and reputation. Here at Toe Tempe we mean business when it comes to assisting our customers on the road. When your purchasing roadside assistance from us your not only getting fast and professional help, your getting a reliable, honest and safe experience from start to finish. No other towing company in Tempe Arizona offers the amazing tow services that we offer. We guarantee our tows and all our work. We promise your complete satisfaction for your vehicle towing in Tempe and anywhere really in the entire Arizona Valley. So when your in a bind and need the right towing help and assistance, you now know who to call. Trust your Tempe Arizona Roadside Assistance Experts. We know how to get the job done right the first time, every time!